I've been acquiring many old photos / postcards over the years with the intention of posting them. I'll try and get round to doing so here. If anyone has an issue with copyright (most of them should be out of copyright) then let me know and i'll remove if required. 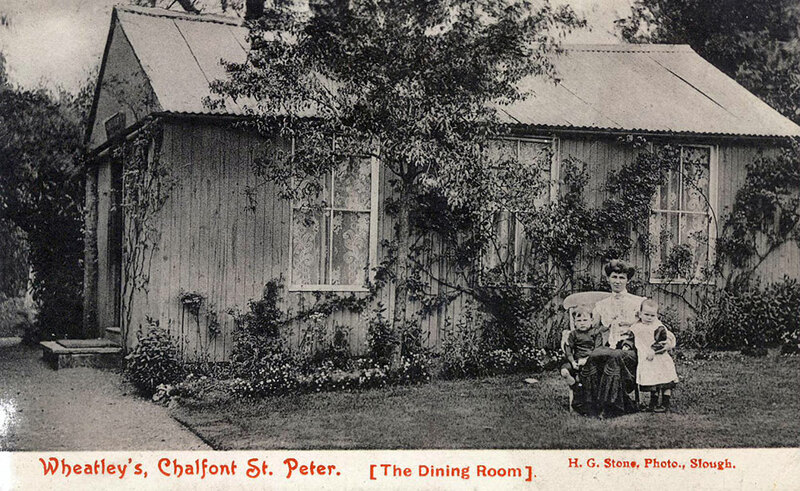 http://www.chalfontstpeter.com/forum/old-pics_topic8268.html" rel="nofollow - Discussions here . http://www.fired-works.com/" rel="nofollow - http://www.fired-works.com/ at the top of Market Place do a great range of coasters and table place mats, pop in and enquire! 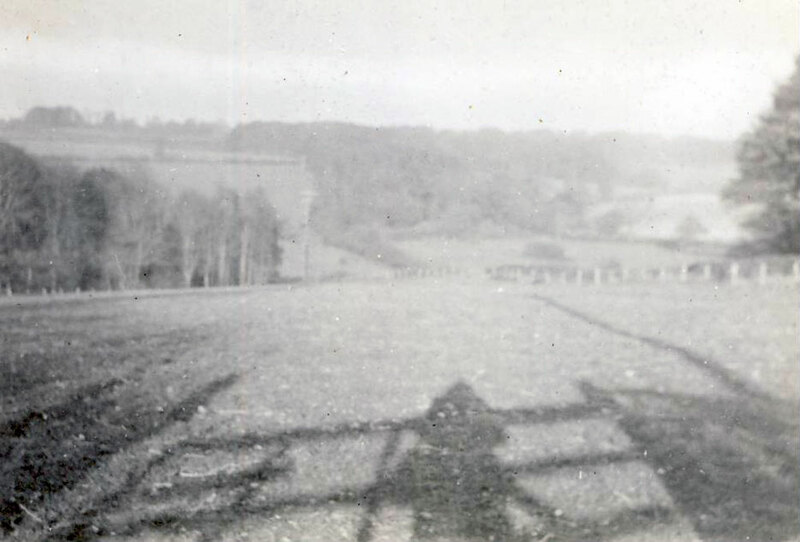 A photo of Whan Cross, a bit of research looks like it is Welders Lane where there was a http://www.chalfonthistory.co.uk/whan_cross.html" rel="nofollow - huge roman gold find but only from the mid 20th Century and this photo looks earlier. 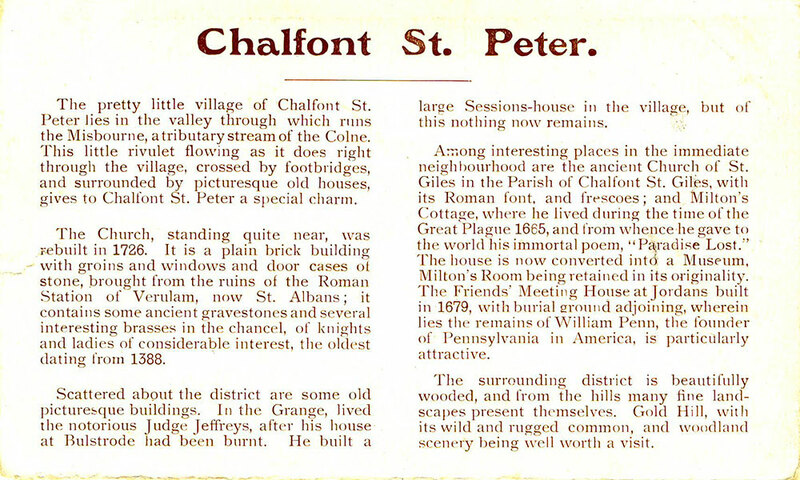 Also on this forum, RoyB mentions Whan Cross as being the http://www.chalfontstpeter.com/forum/tales-of-chalfont_topic2272_page7.html%20" rel="nofollow - scout camp . 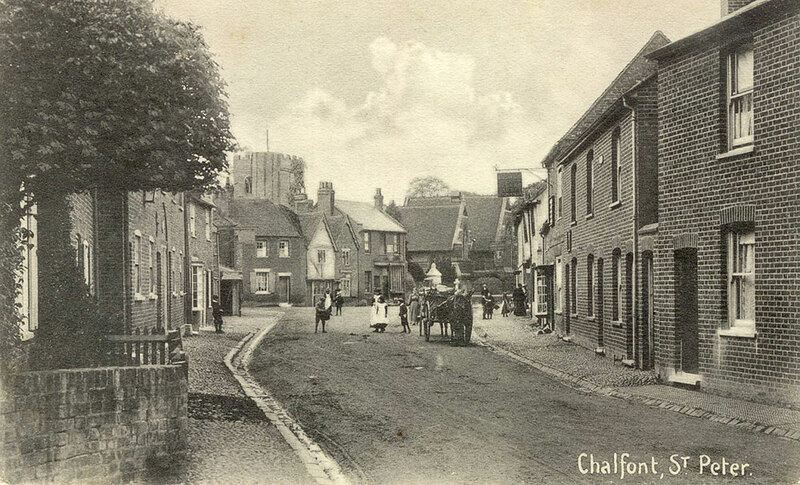 http://www.chalfontstpeter.com/forum/old-pics_topic8268.html" rel="nofollow - Discussions here . 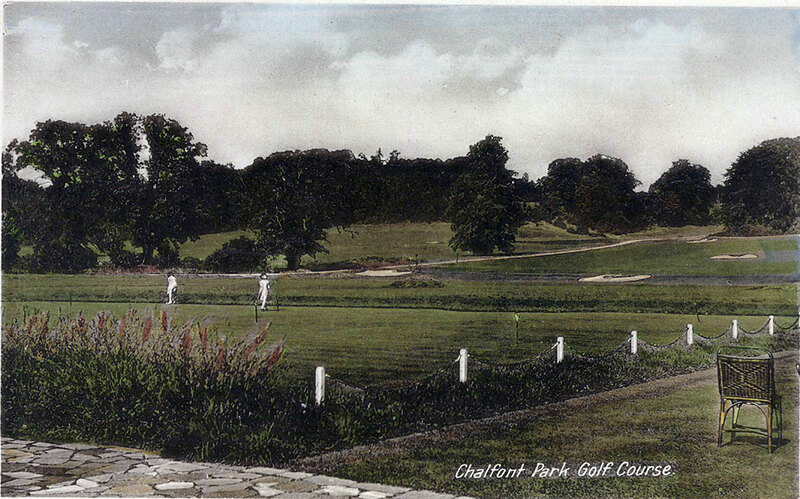 Chalfont Park with drive, no idea of the date. 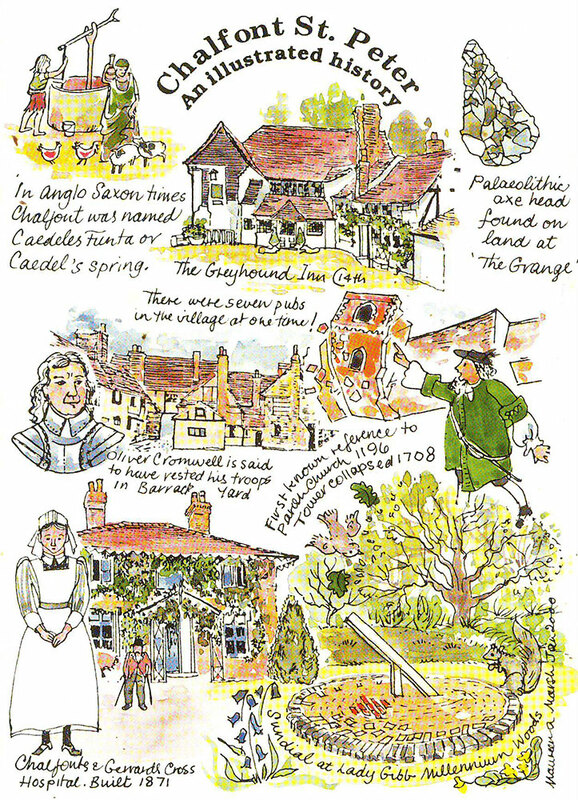 An almost identical one to the earlier Gold Hill postcard, but in colour, post marked 1961. 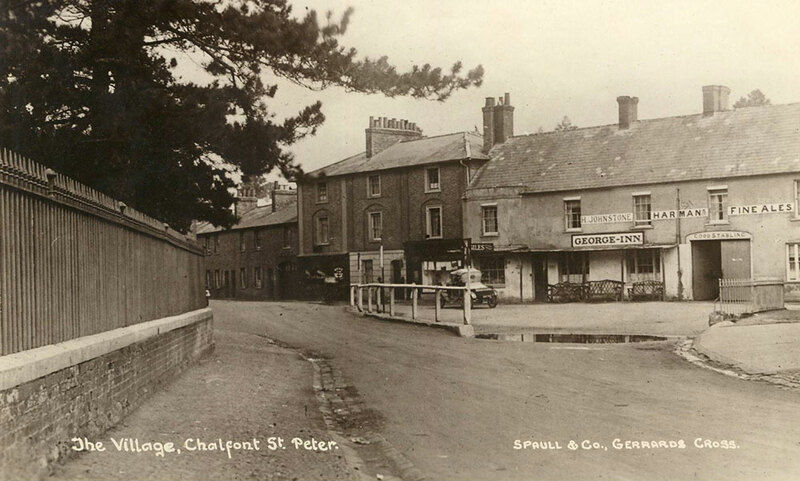 Market place looking down around 1930. Gravel Hill / Waggon and Horses, no date but old! 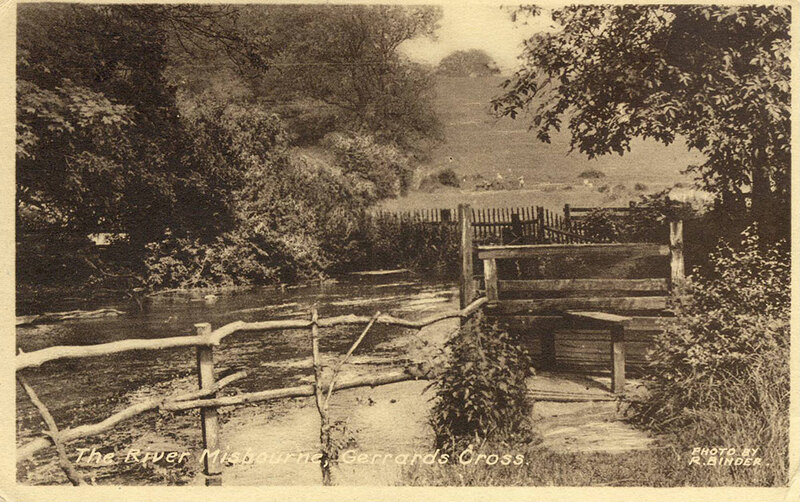 The river Misbourne in Gerrards Cross, not sure where precisely, 1947 postmark. 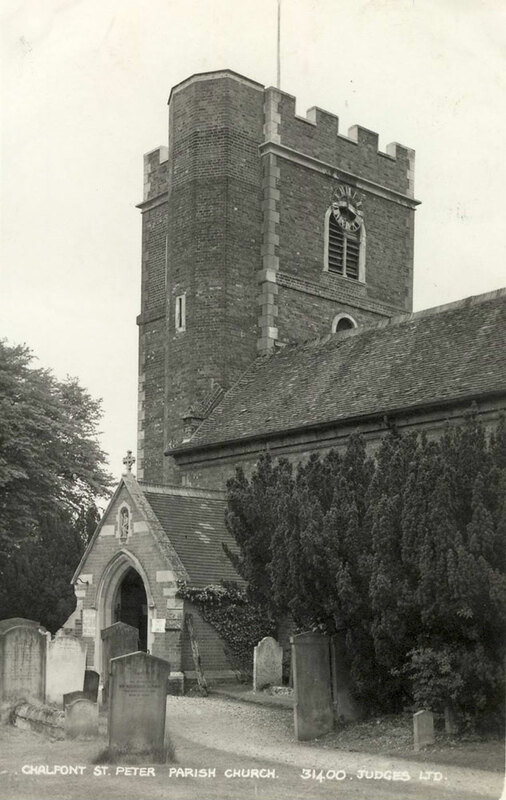 First of plenty of the Parish Church. This one is circa 1968. 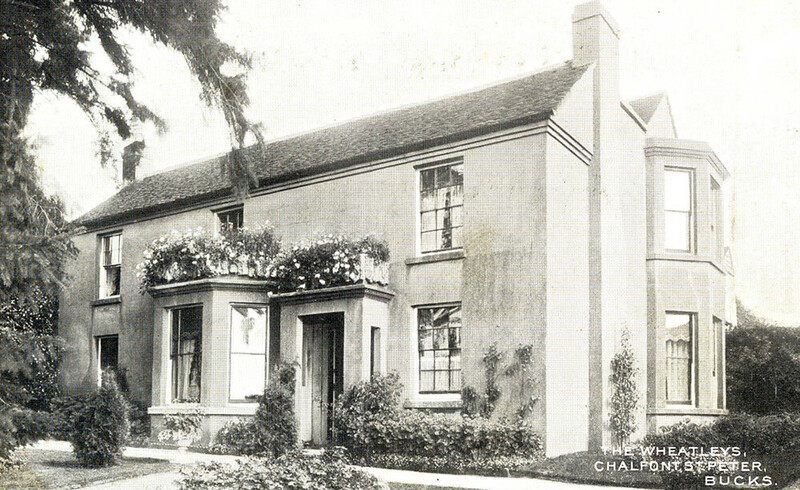 Another NSE photo, this one of Eleanor and Hampshire Homes, date unknown. 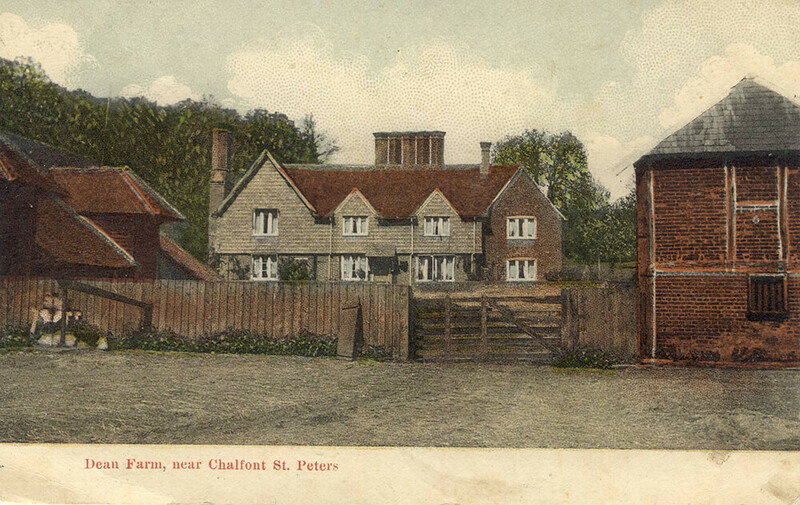 Dean Farm, Chalfont (More Jordans / Seer Green), postmarked 1905. A second photo of The Wheatleys. 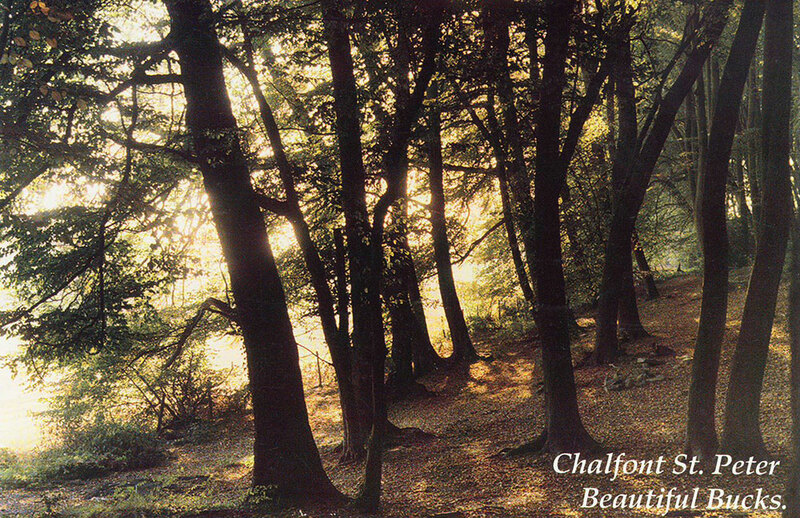 The Beech Woods, Chalfont Common, post marked 1963 - any ideas which woods these are? The coronation clock at the bottom of Gold Hill, postmarked 1967. The Greyhound with horses and ford. No postmark date. 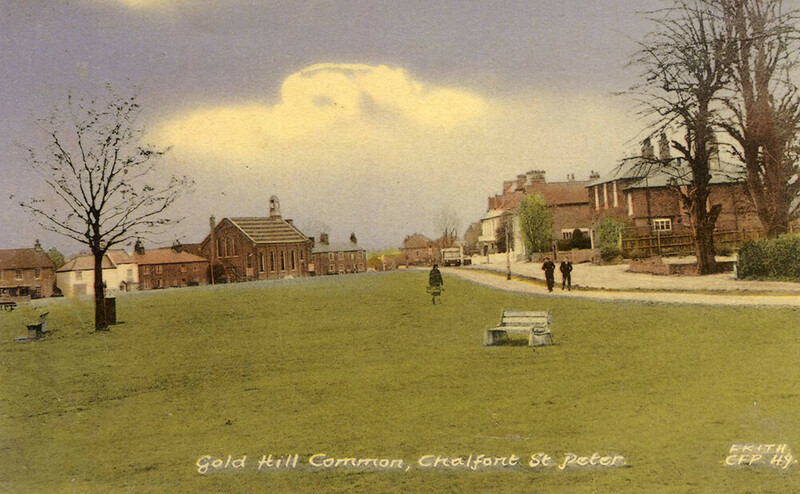 Gold Hill Common, The Chestnuts, Chalfont St Peter postmarked 1912. 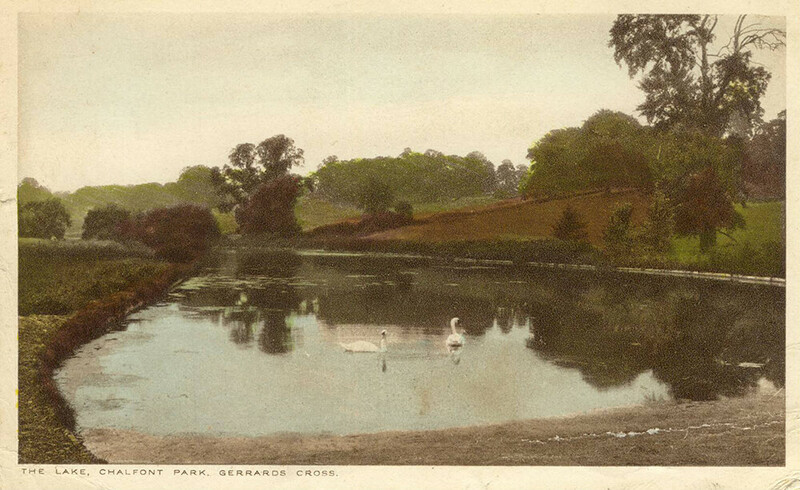 The long since gone pond featured here also appears in later postcards. 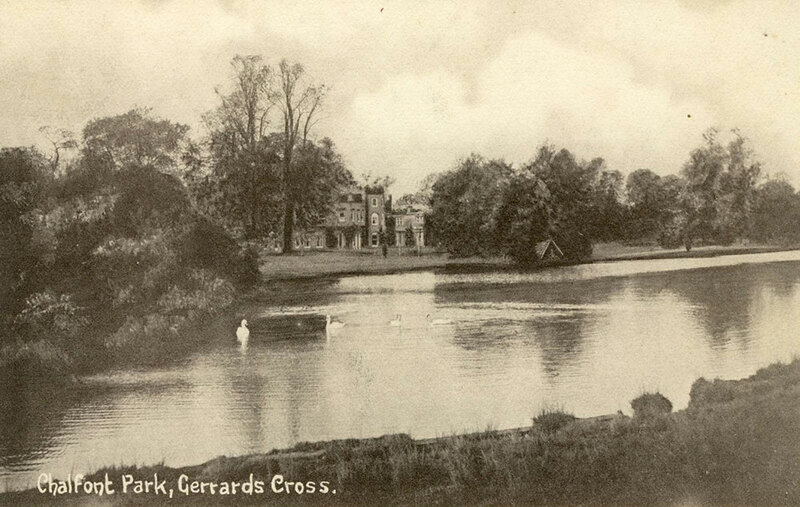 Chalfont Park again, this time marked as Gerrards Cross with a post mark in 1927. Not sure whereabouts this is. Thanks to Art who suggested "Home Farm. 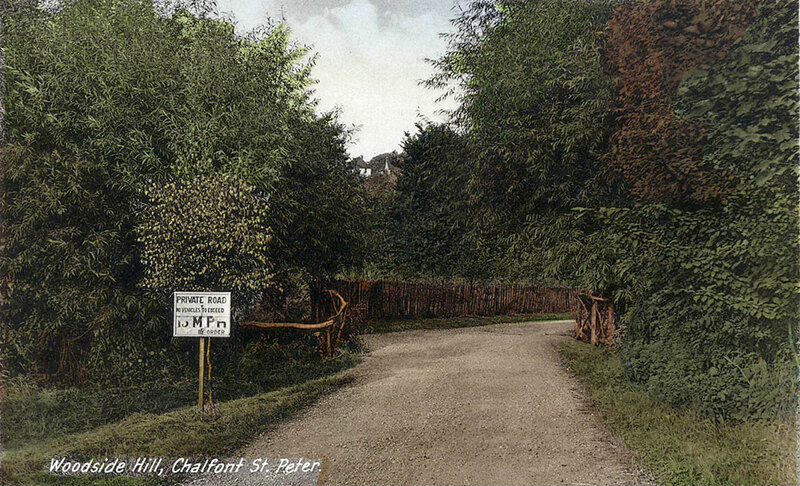 It was on the right hand side as you went up the track through (well over the little footbridge) the ford, past the weir at the end of the lake up towards Chalfont Lodge." 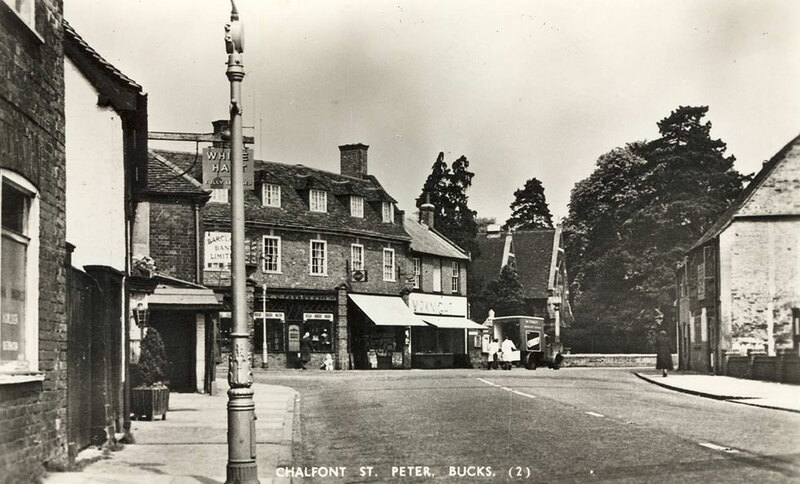 Looking down the Market Place in Chalfont St Peter. Postmarked 1928. Back to the Greyhound, but from the 'roundabout' side, though of course no roundabout when this was printed. No postmark for date. Notes Judge Jeffreys. Gold Hill, West side view, no postmark for date. 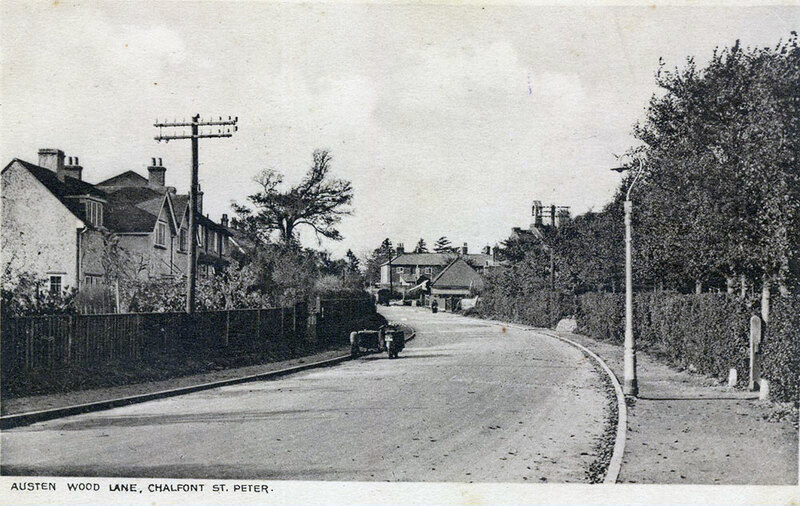 Austen Way, i think the postmark was 1963 but not 100% sure. 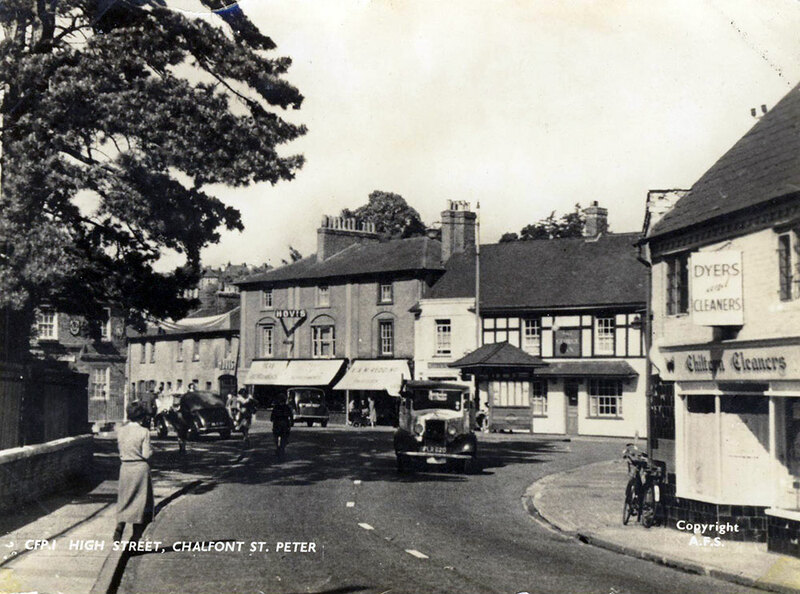 A bus in Chalfont St Peter in May 1935! White heather lancet green and white (for those of you looking at it in black and white). 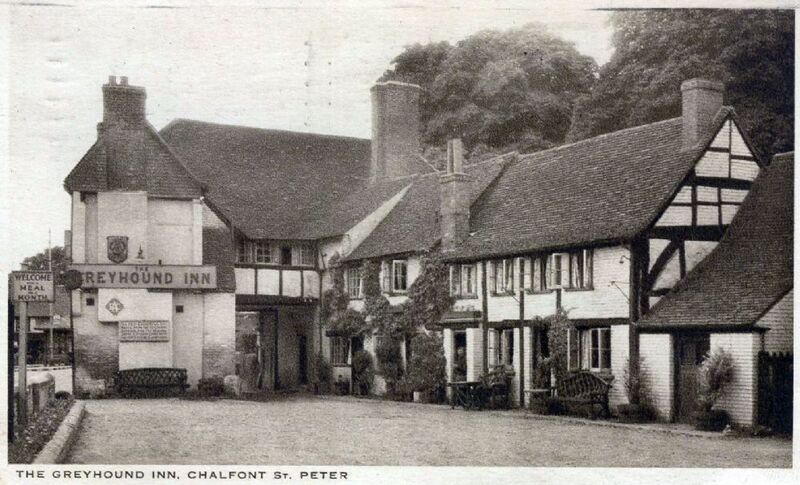 Chalfont Park Hotel, no post marked date. 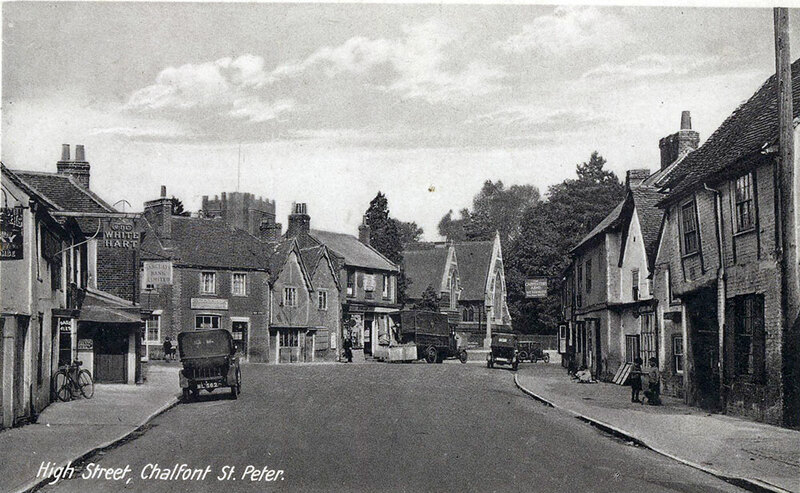 An original photo from 1935, though no idea where, but promised that it was Chalfont St Peter! 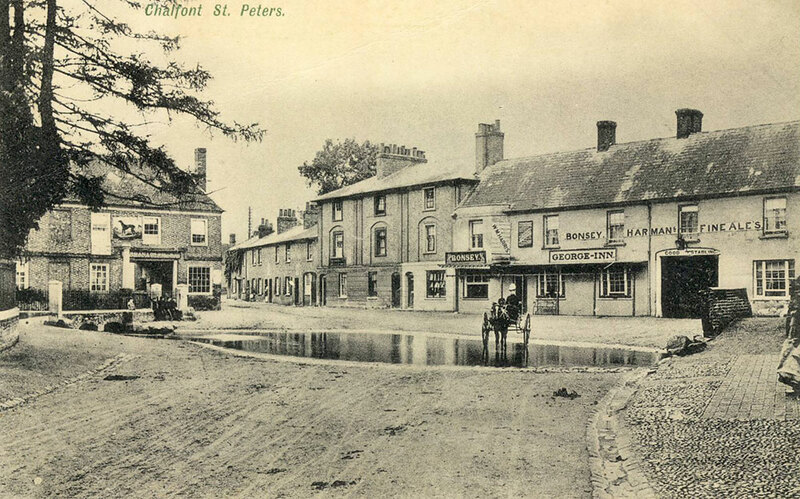 The High Street with The George, Greyhound and the River Misbourne covered over. No postmarked date. Gold Hill, West side view, no postmark. 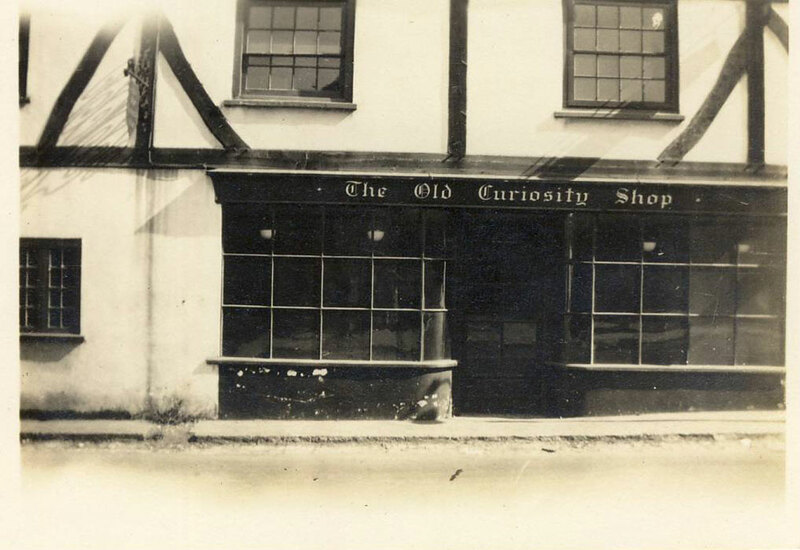 The Old Curiosity Shop, 1930. A view of the precinct before it was there, with the bus stop and River Misbourne fully covered. Looks rather nice doesn't it!! Mr and Mrs Grieve of Whins Cottage. 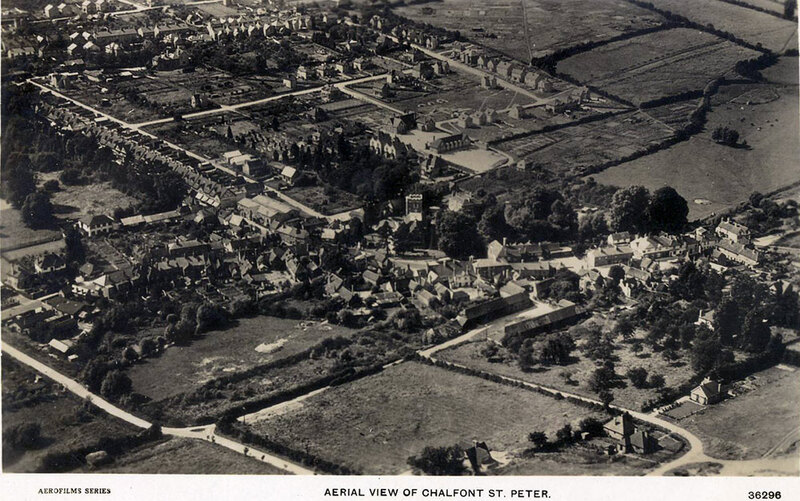 An aerial view of Chalfont St Peter. Another guess the date that will keep you busy over the weekend, also working out where your house is or should be! I know the White Hart used to have this photo or something similar and I often found myself staring at it. 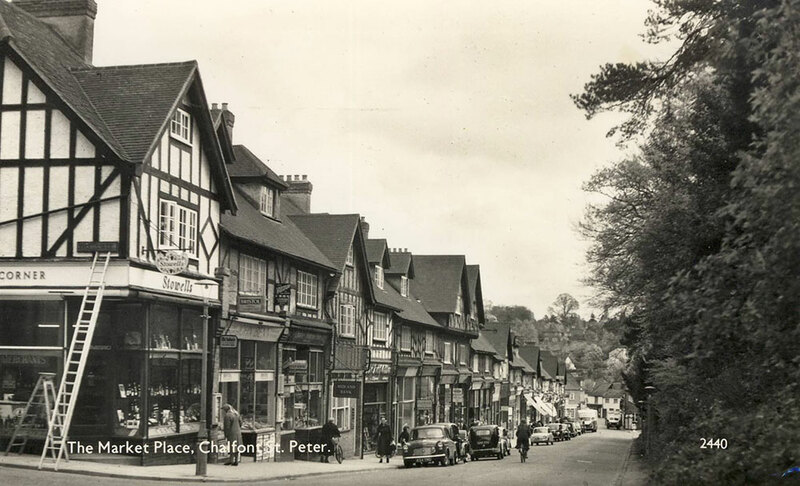 Edit : Thanks again to Art who found a great stash of aerial photos of the village http://britainfromabove.org.uk/en/search?keywords=chalfont&country=global&year=all" rel="nofollow - https://britainfromabove.org.uk/en/search?keywords=chalfont&country=global&year=all so it is 1931. 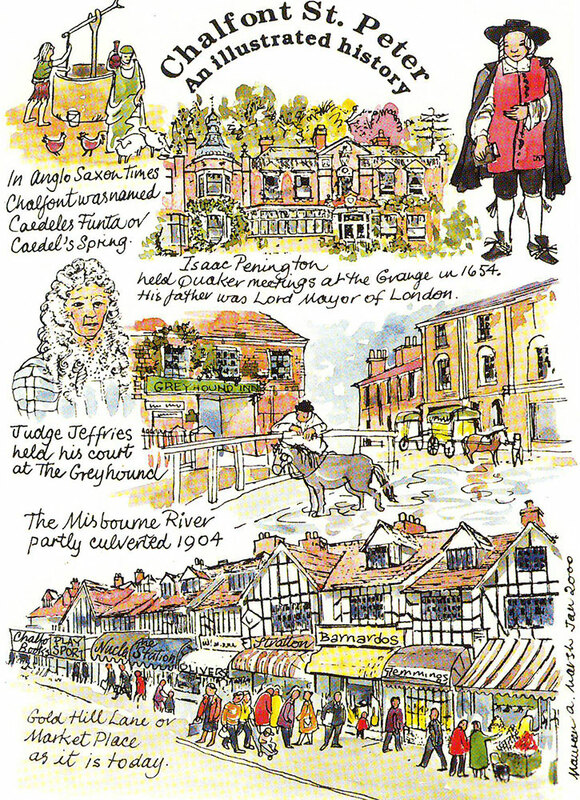 A couple of great pictorial history postcards for the weekend by local artist Maureen Marsh. So the Misbourne started to be covered in 1904 which will help date a lot of the postcards I have / will post of the Greyhound / Misbourne. 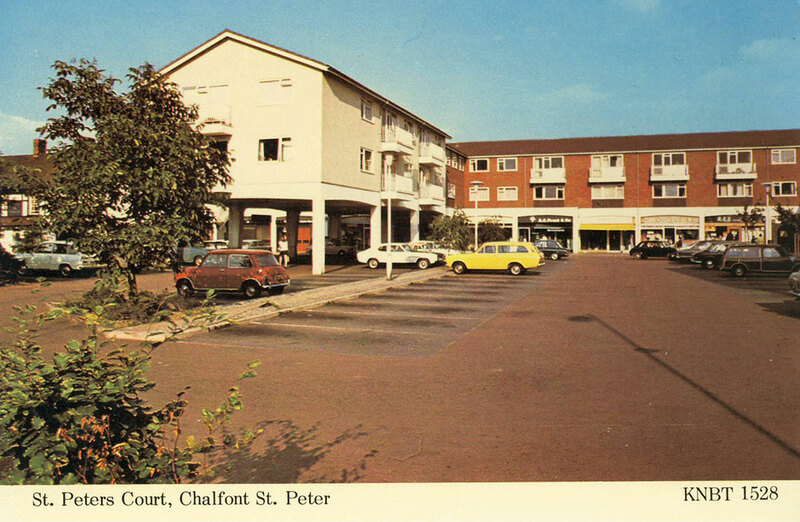 Chalfont Lodge postcard from 1970. 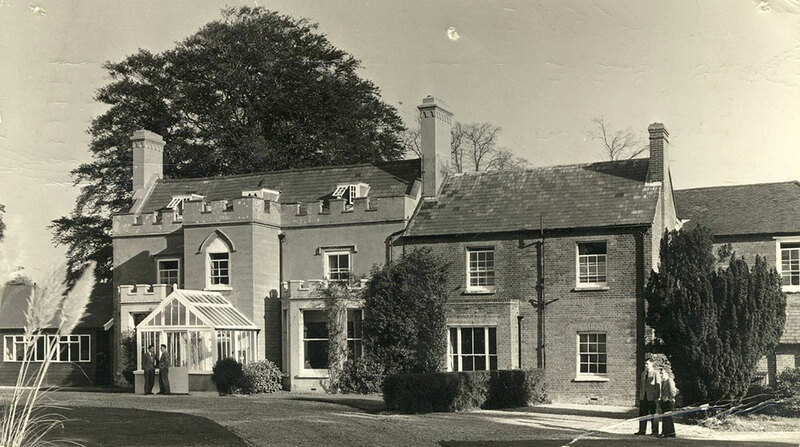 There is a Chalfont Lodge at the top of the GX Golf Club site on Denham Lane, but I know this was only built in the last 15 or so years though might have been on the site of the original. 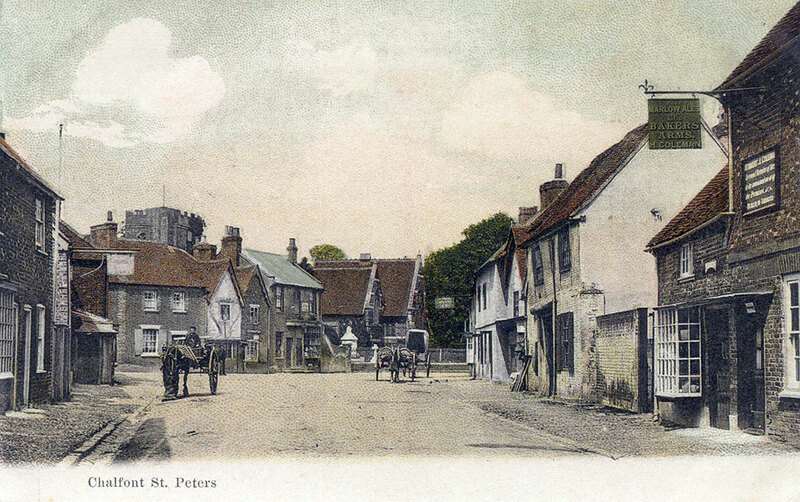 The High Street, postmarked 1905. The bottom of Gold Hill. No postmark to date it. 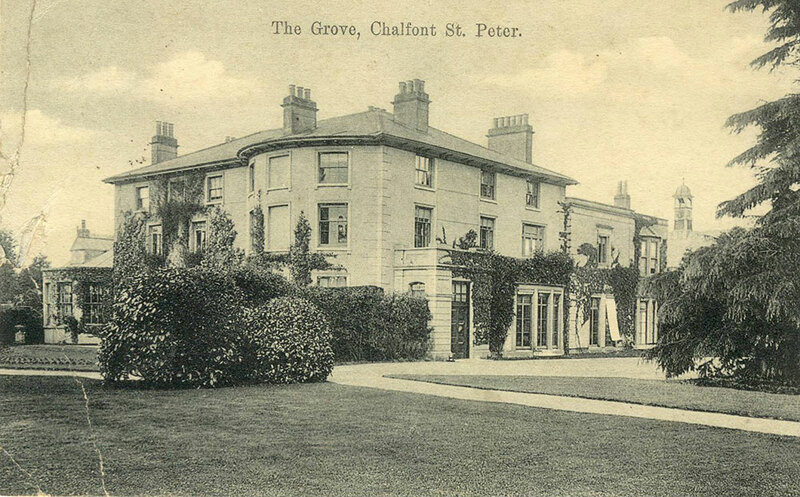 The Grove, Chalfont St Peter, postmarked 1907. Where SSVC is / was on Narcot Lane now. To get you in the mood for a leisurely weekend, here is the NSE's recreation ground. I wonder if it is the current football pitch by Cricket Field Cottages, I assume so. 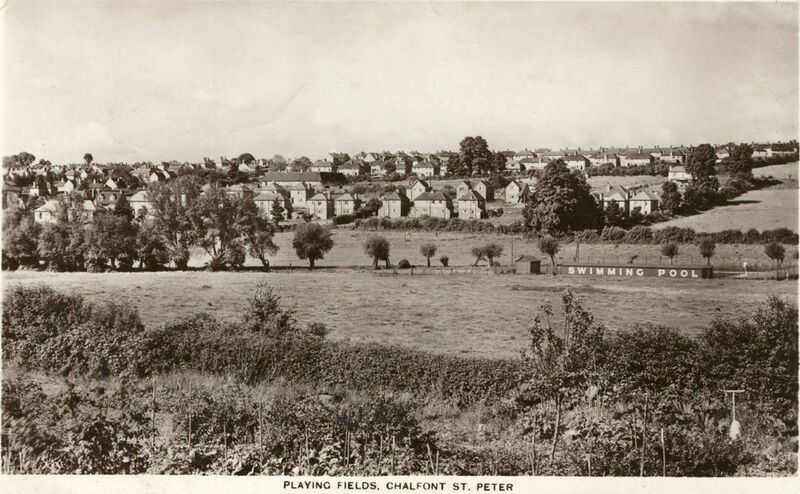 Chalfont St Peter Hockey Club used to play on the football pitches in the early 70's, definitely for summer games, unlikely for winter games. Looks like a water tower on site too? 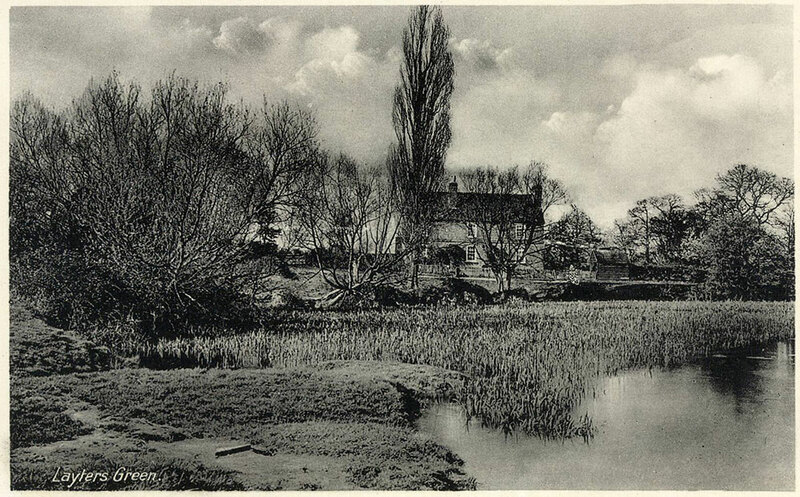 Austen Wood common, postmarked 1939. 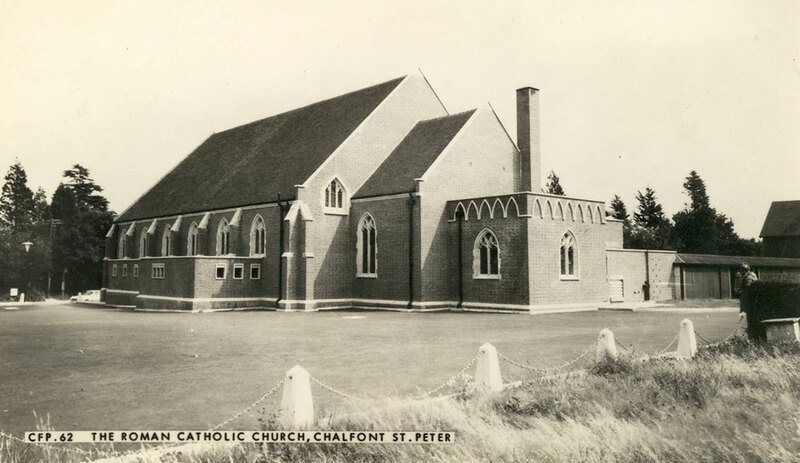 School Lane and the Catholic Church are in view. 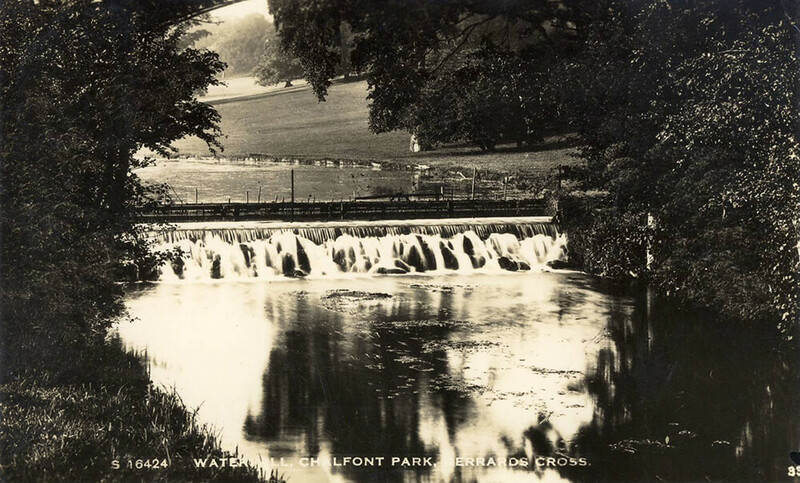 Remarkable how few trees there were on the Common then. Back to the top of Gold Hill and the Chestnuts. 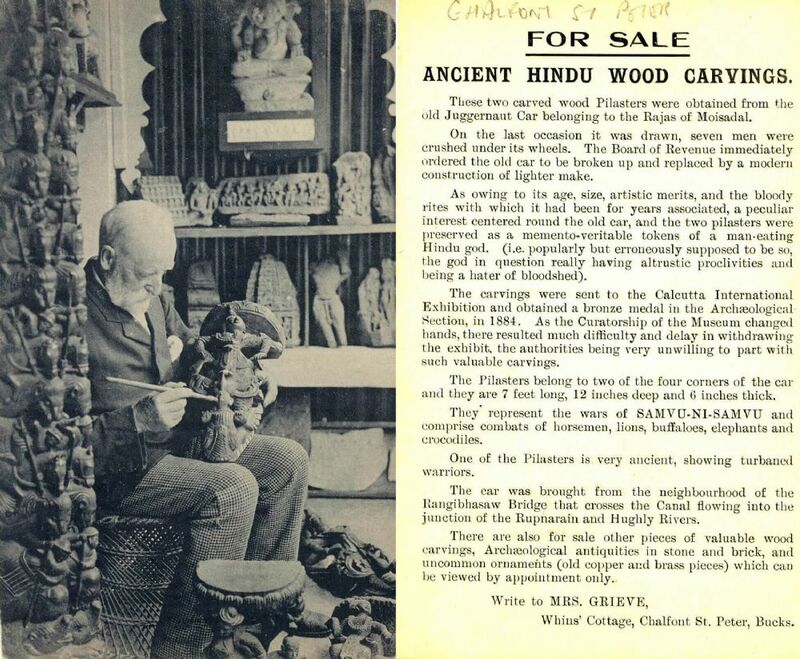 This postcard has a brief history which I've also posted. No postmark to date it. 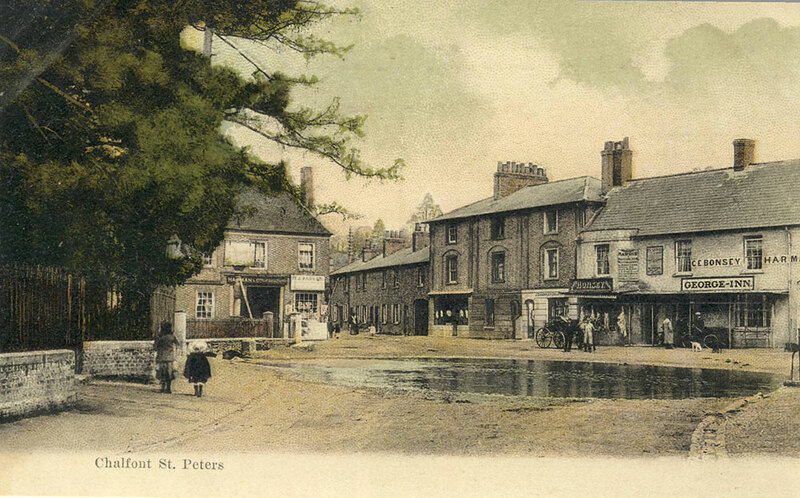 The High Street in colour, no postmark, but before 1904! George and Greyhound in view. A big push for keeping it local at the moment and at Feast day tomorrow. 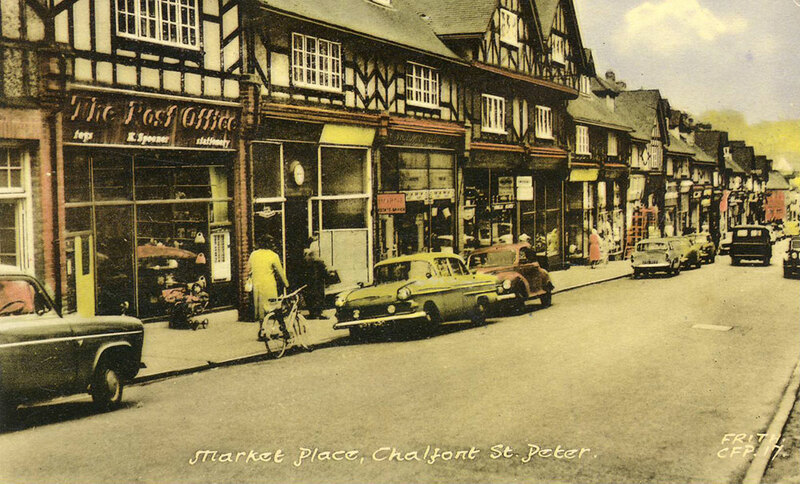 Here's what the Market Place looked like circa 1955. Edge of the cycle shop which i'm sure I remember from the late 70's, and sadly topical with the recent demise of the Chiltern Barn cycle shop. 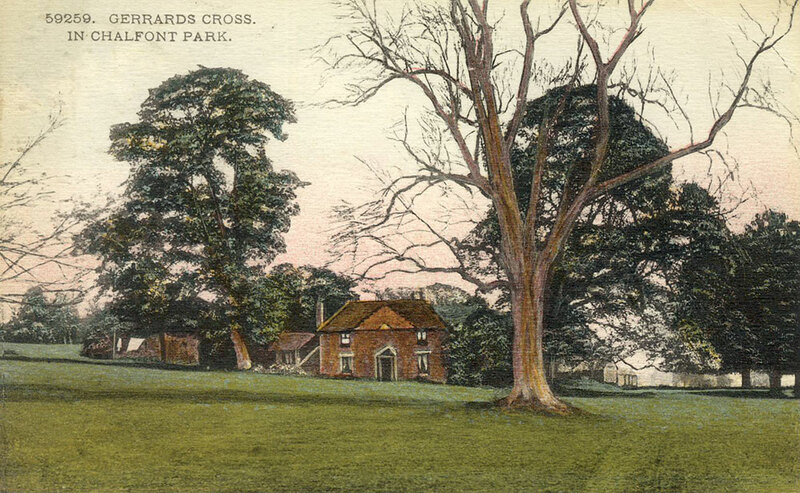 Austenwood Common, no date but early. Layters Green at the top of the village. 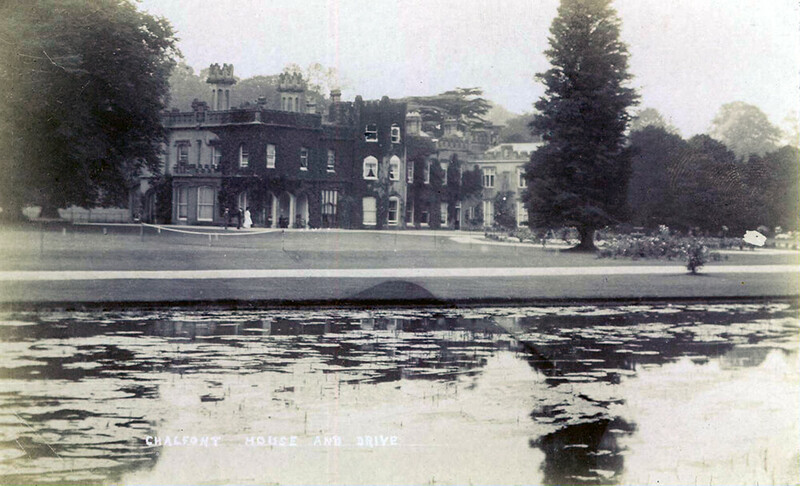 I presume this is the same pond as the one still there today and the house is the old Willow house that has recently been knocked down and several put in its place. 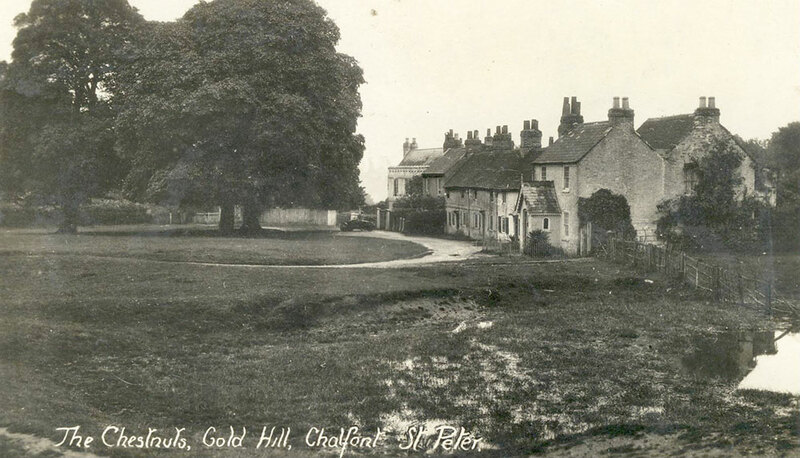 Gold Hill Common West, post marked 1962. 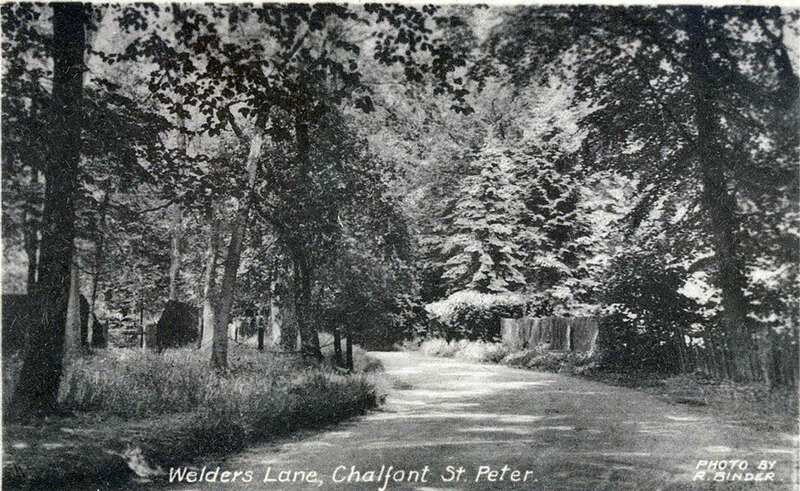 Welders Lane, no postmark on the card. The Market Place with the post office complete with Cadburys vending machine (thanks Sid!). Post marked 1963. 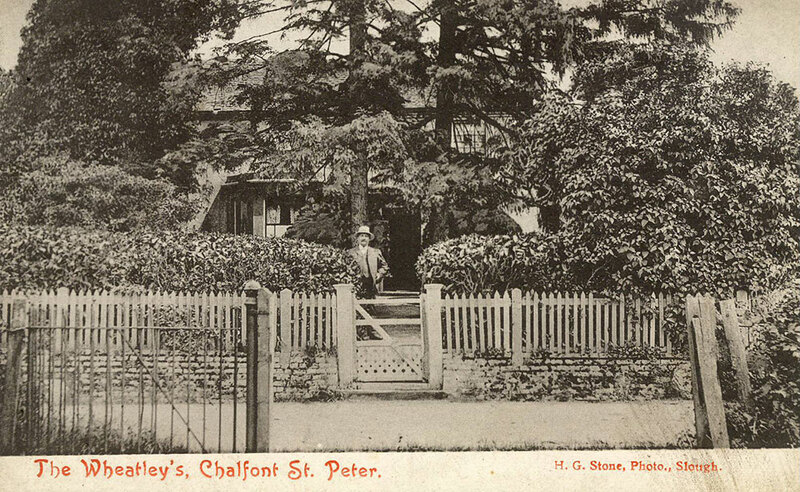 Chestnuts, Gold Hill, postmarked 1906. 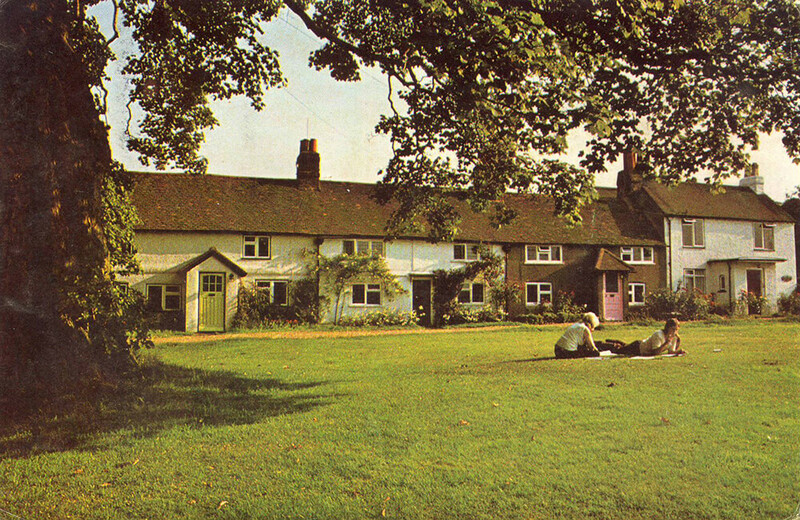 Chalfont Lodge gardens, postmarked 1970. NSE 'Chalfont Colony' Kitchener Building, no postmarks. The Bakers Arms (Poachers / Phoenix)and Barclays Bank, no post mark to date. 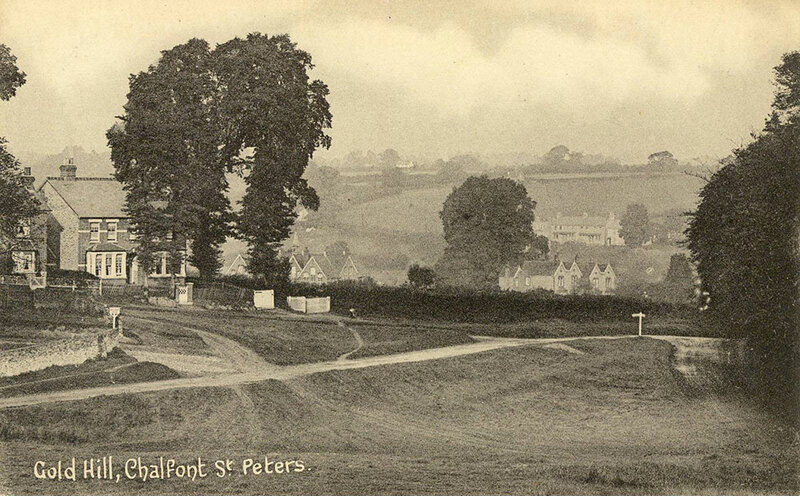 Chalfont St Peter viewed from Gold Hill. 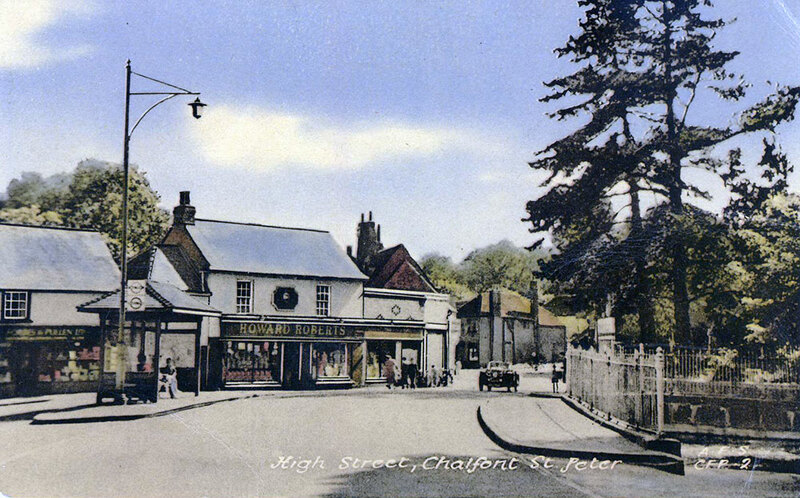 High Street with the George and Church railings. No post marked date. 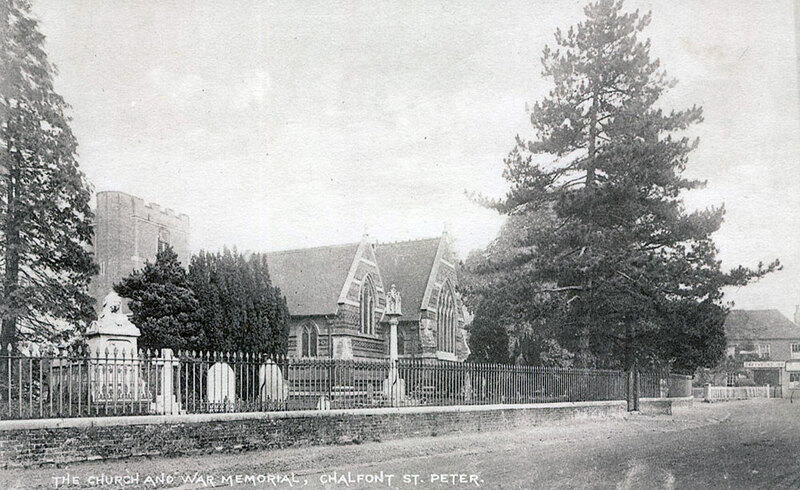 Chalfont St Peter Church and Memorial, no post mark for date. 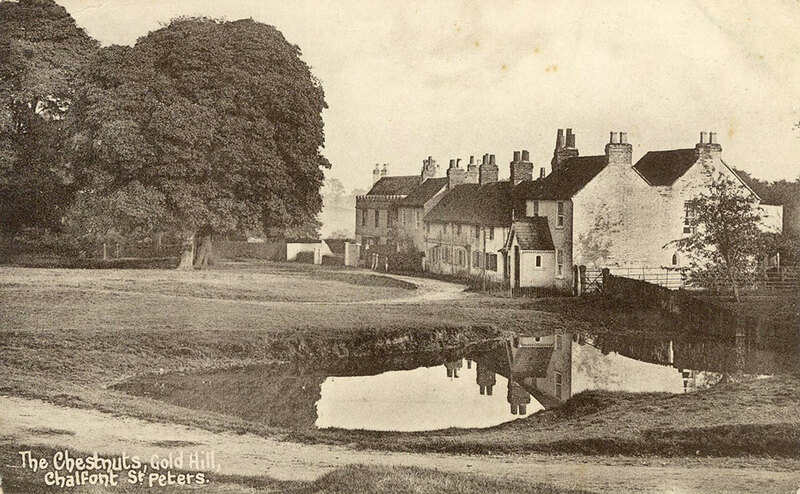 The Mill Pond and Splash, Chalfont St Peter, early 1900's. 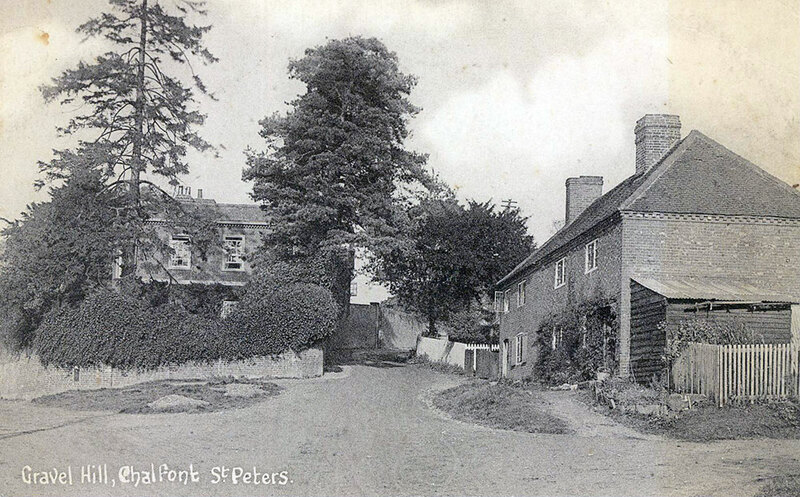 Notes from Audrey Wheelband : The remains of the Mill, on the right is the rear of Mill Cottages which faced the high street. Further on was Mill Farm. 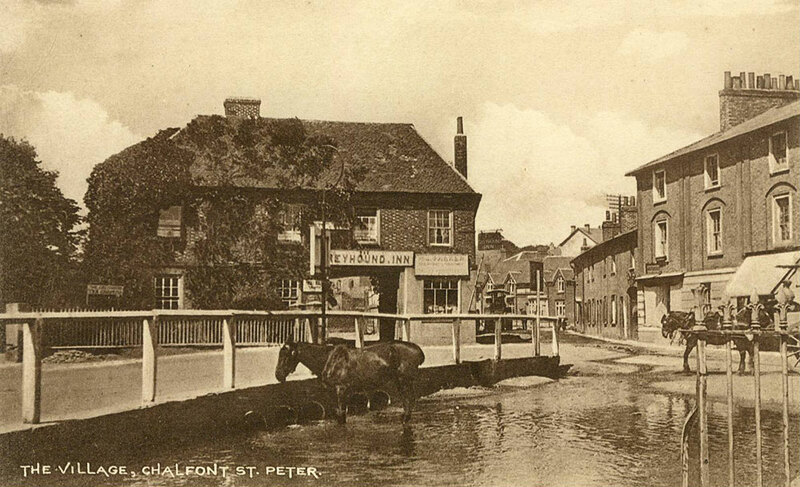 The willows grew on either side of the river which is flowing here from Chalfont St Giles. The 'water fall' and wall are no longer. To the left are the playing fields (the Football Club / tennis Club and Community Centre and to the right the trees are where the scout hut and parish council is now and built in the Elms. The relatively new Lady Gibb wood is also in the grounds of the Elms - you can see the back wall of the Elms as you walk by the allotments up to the Waggon and horses. 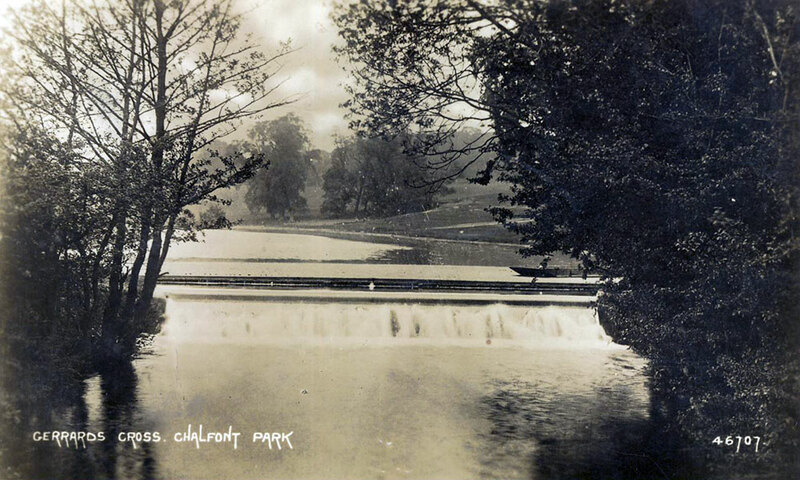 Chalfont Park and lake, no post mark date. Wheatleys Dining Room. On further research, Wheatleys was at the time a guest house and hence this isn't as random as it appears. No date on the card. 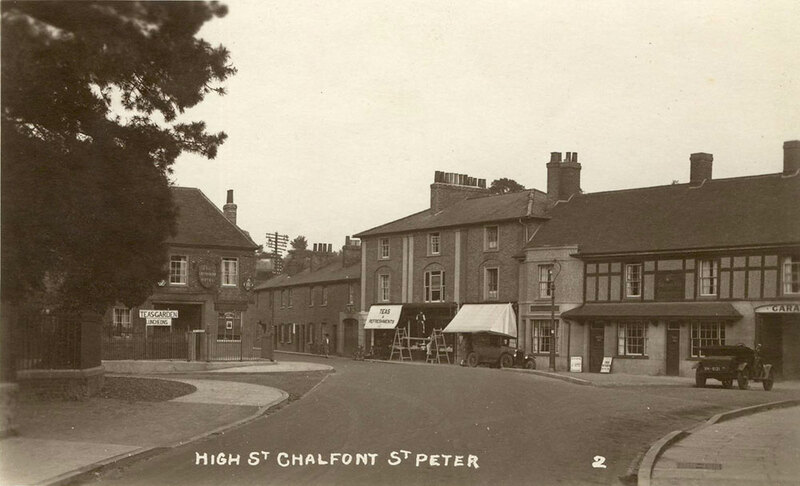 High Street, 1932 with the White Hart, Carpenters Arms and Parish church in view. A view of Gold Hill without any caravans on it. Post marked 1937. A recent photo (90's) by a Stan Nettle of West Hyde Lane. 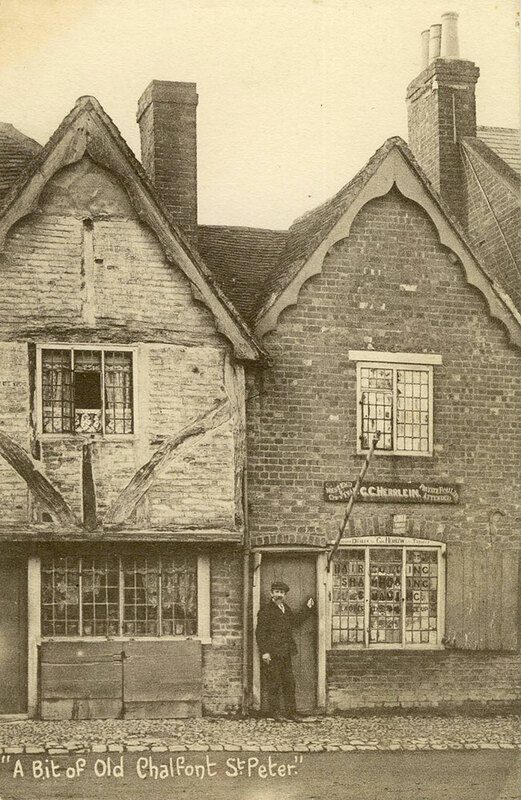 The foot of Rickmansworth Lane, a house that must have been knocked down and the building where Fairweather insurance is now. No post marked date. 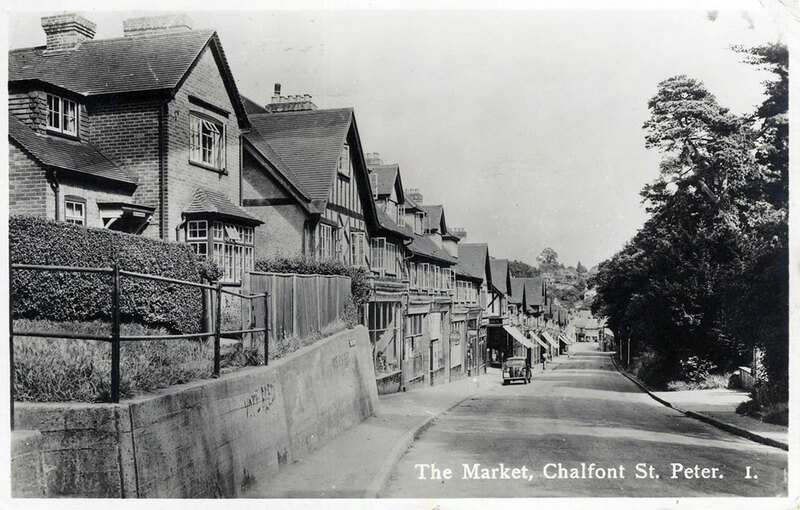 The Market Place, no date. 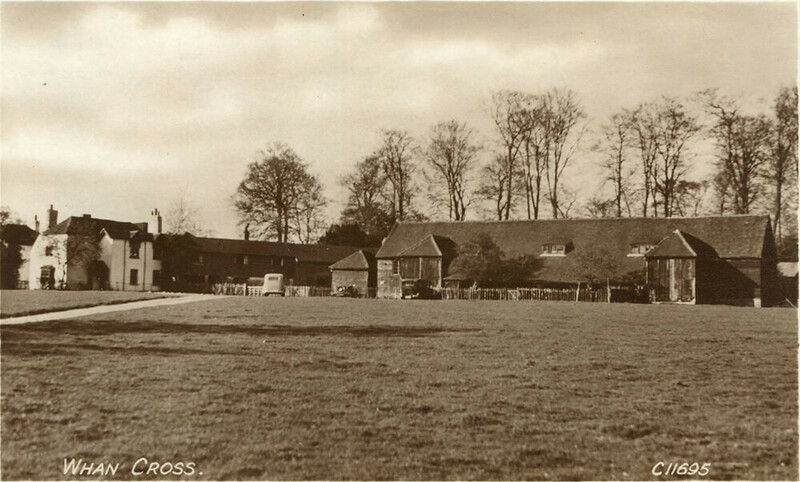 When I started scratching the surface of the village's history, I was fascinated to learn there was a swimming pool by the playing fields on the Misbourne. I was just as surprised to find I had this postcard I'd completely forgotten about and is now my favourite posted so far. Postmarked 1949. 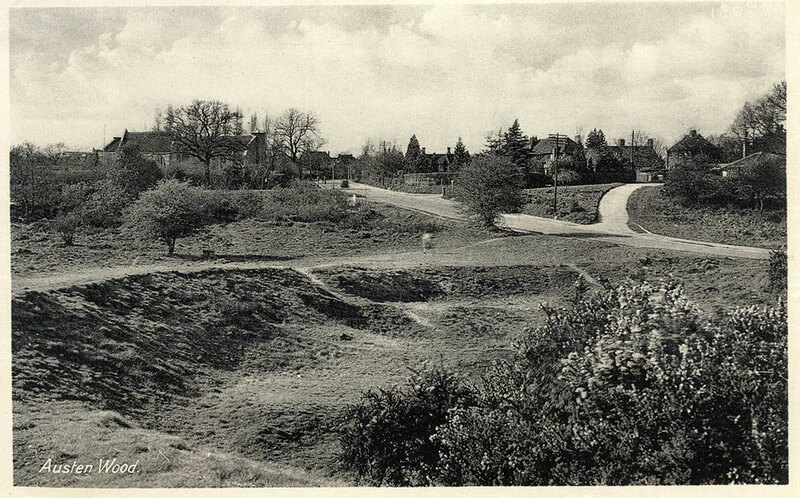 Gerrards Cross Golf Club, or Chalfont Park Golf course as it was. No post mark date. 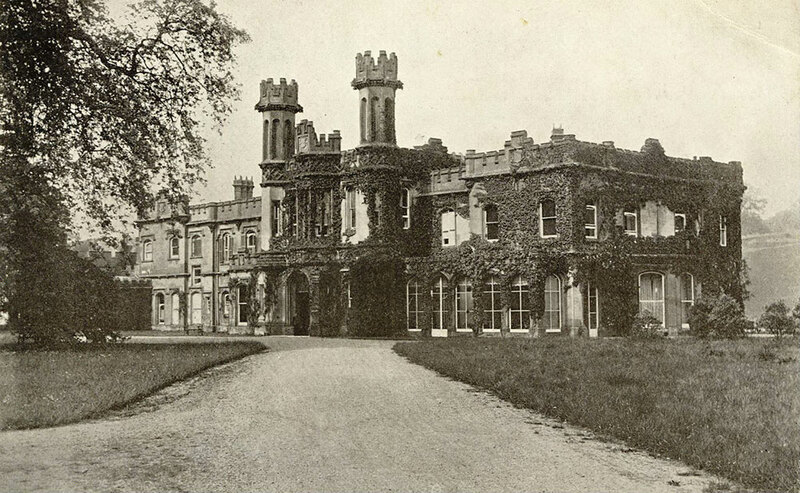 I think the transition came when Lady Edgar died and the grounds were sold off, also applies to the Cricket Club. 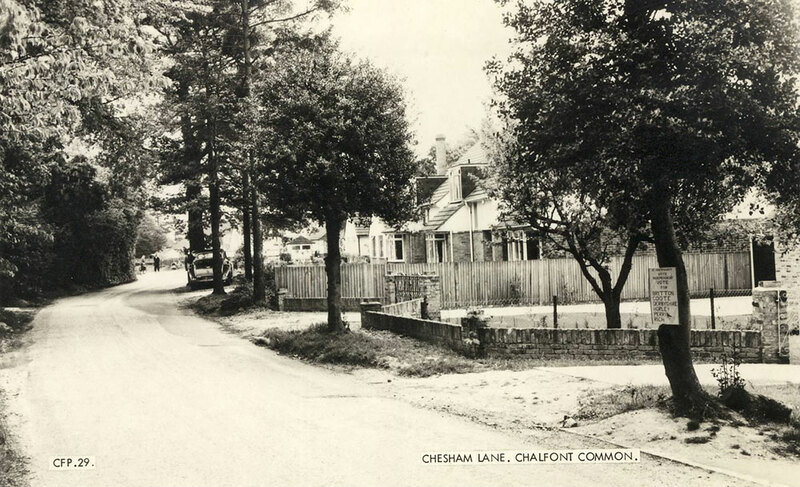 Chesham Lane, no post marked date, early 60's i'd imagine. 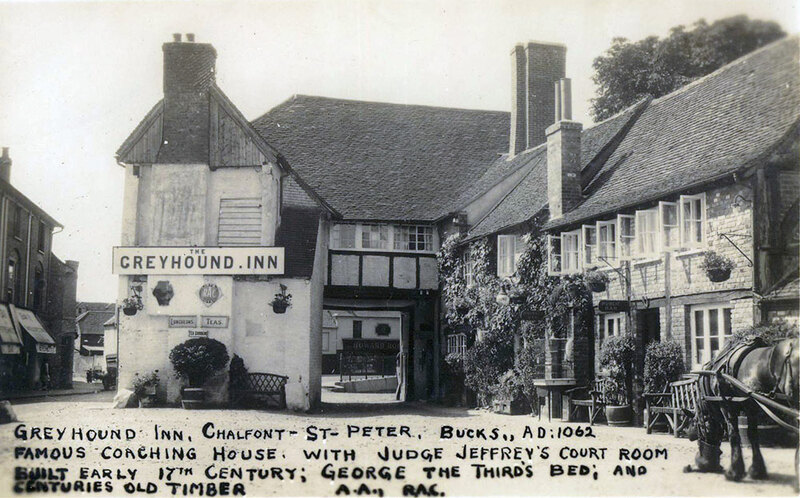 Greyhound Inn, post marked 1940. 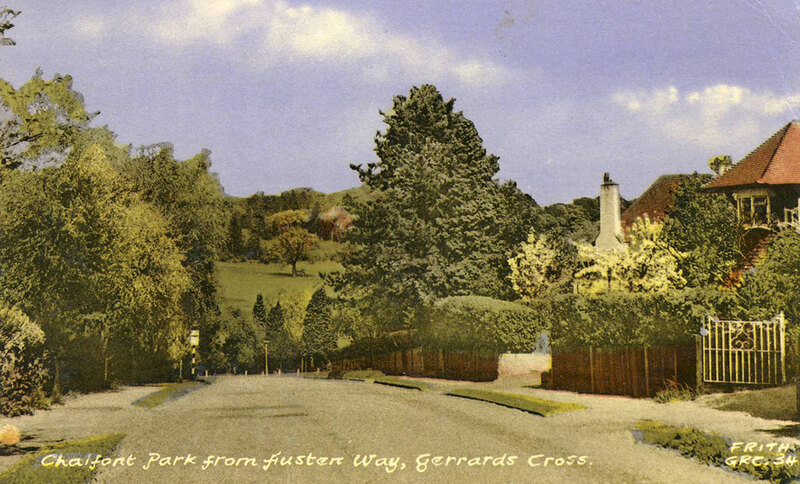 Woodside Hill postcard, no date. 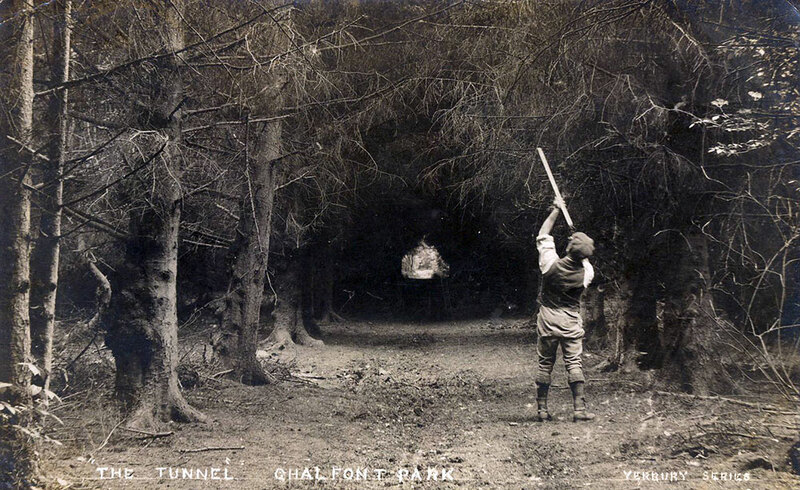 The tunnel at Chalfont Park, post marked 1907. No idea where this is? Maybe the footpath across the golf course / the back of the cricket club? The Colony (NSE) Women's side. No post marked date. 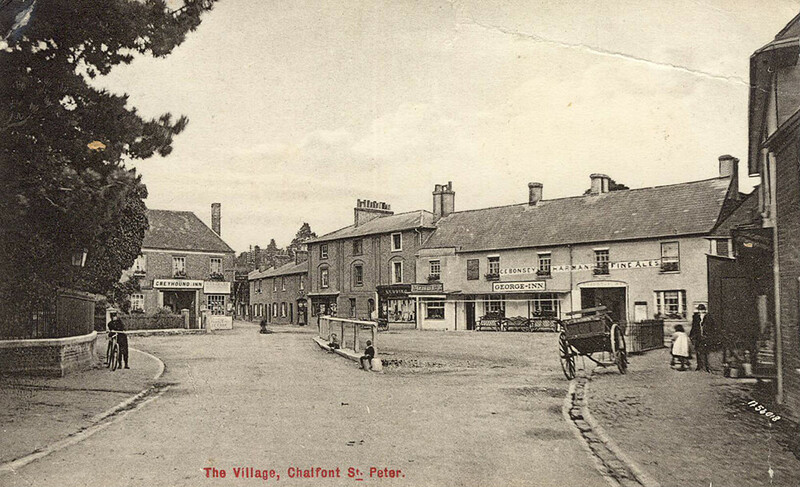 Chalfont St Peter High Street, Postmarked 1964. 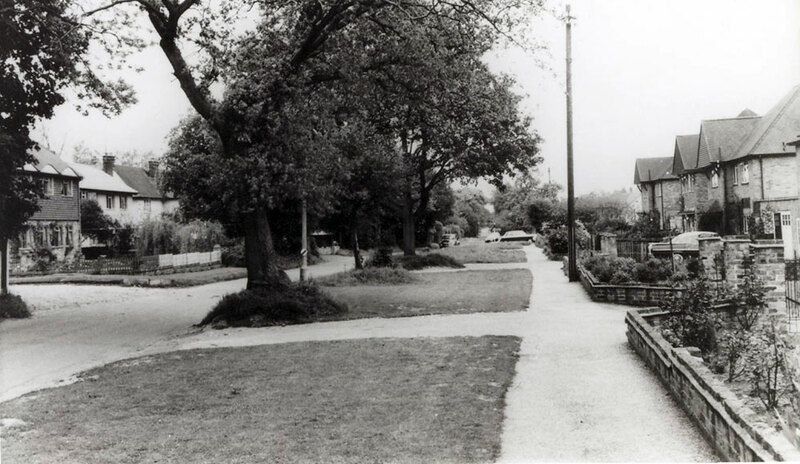 Denham Lane, no date but late 50's? Interesting speed sign for 60mph - that would have been interesting on that road / surface. I'd hazard a guess the side road is Nortoft Road, but not convinced. 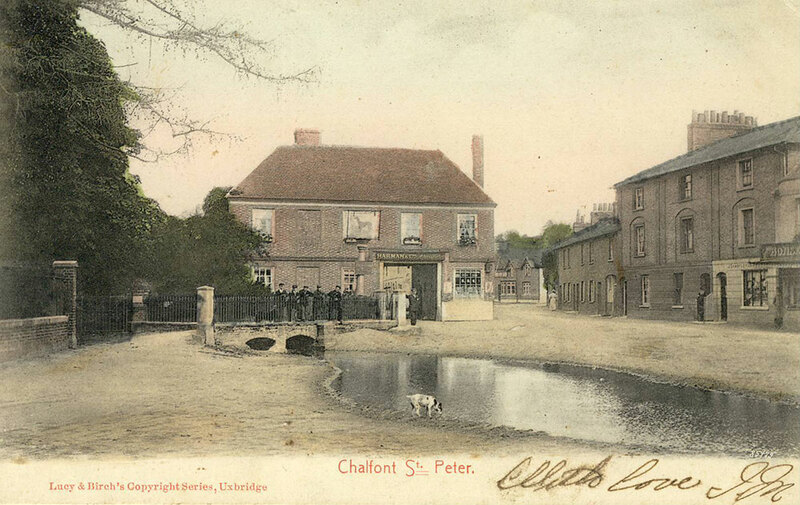 The old Chalfont St Peter is noted in Audrey Wheelbands book "These two charming early 16th century cottages stood in the high street next to the post office. In the first, to the left, lived the Wingfield family. Annie Wingfield was a teacher in the infants school all of her working life. Several generations were taught their first lessons by her. Next door was a barber, pictured standing at his door. His name was Mr herrleinn. He was a German and, during World War I, young boys bursting with patiortism would throw lighted 'squib' fireworks through his doorway. He called for police protection. Replacing this beauty spot now stands new three storey building with shops on the ground floor." The High Street, not postmarked date. The Bakers Arms and White Hart. 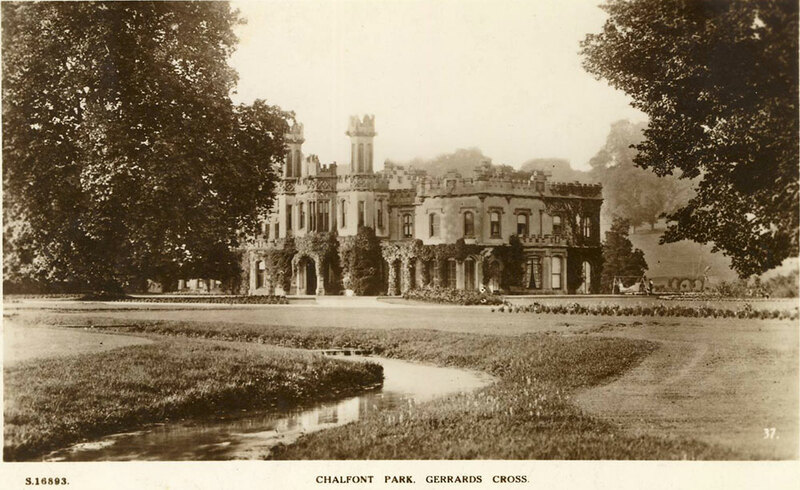 Chalfont Park 'Hotel' and golf. No post mark date. 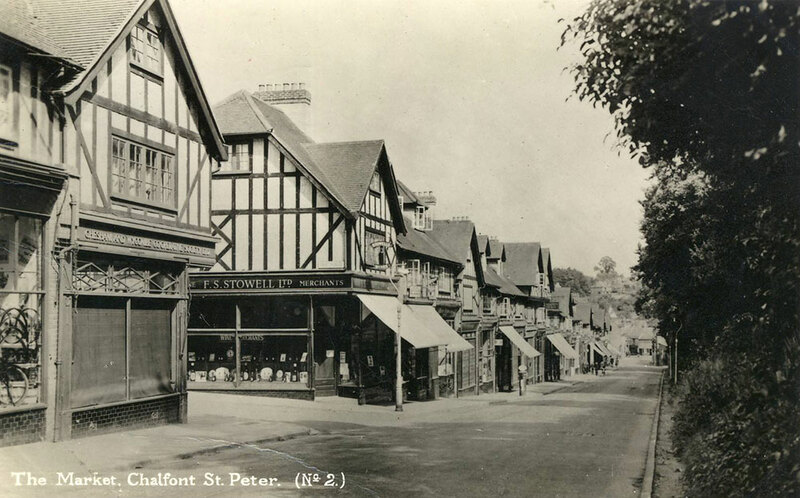 The High Street is from various angles and dates the most common postcard I have purchased. 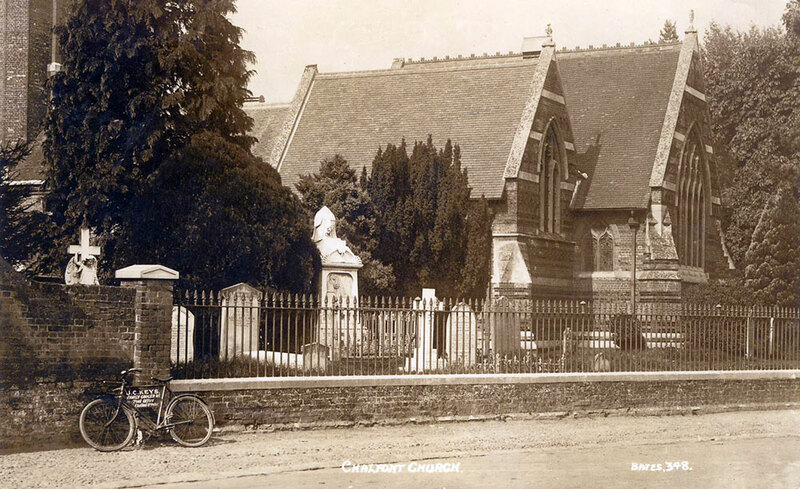 Here is one with no date or road so pre-1904. Let me know if I duplicate one! 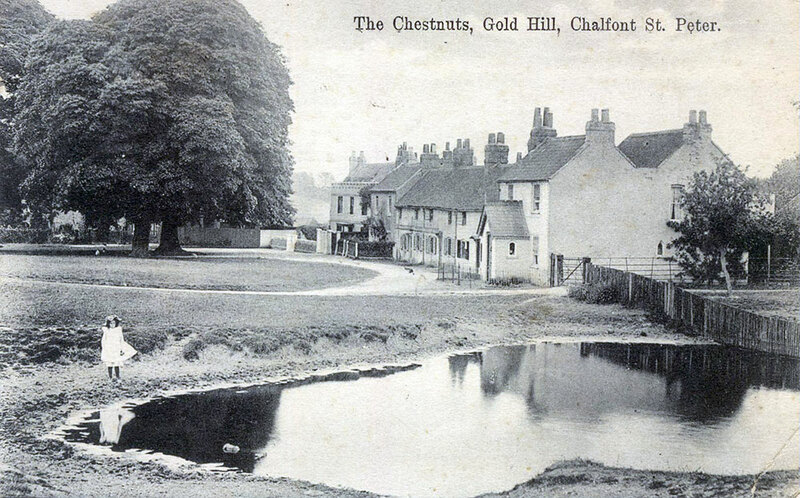 Gold Hill Common in the 1940's with the Chestnuts pond. 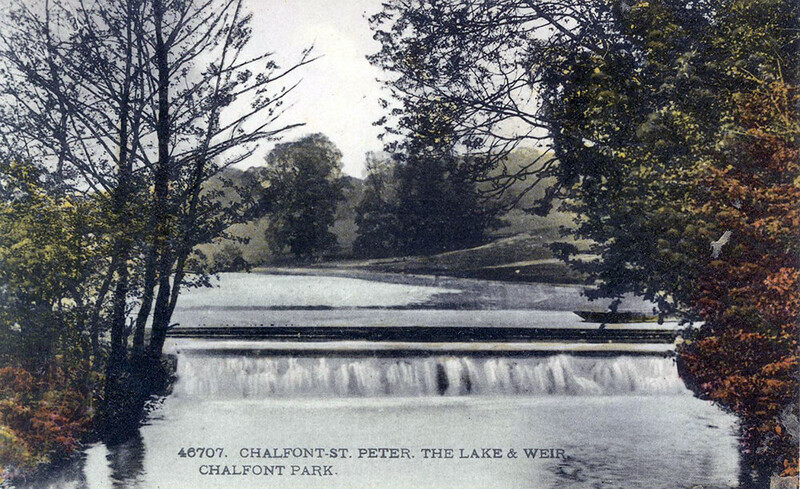 Chalfont Park Lake and Weir, no post mark date. No island as at the moment from the looks of it, but I think from memory the island as it is now only appeared late 80's / early 90's after some major works there. 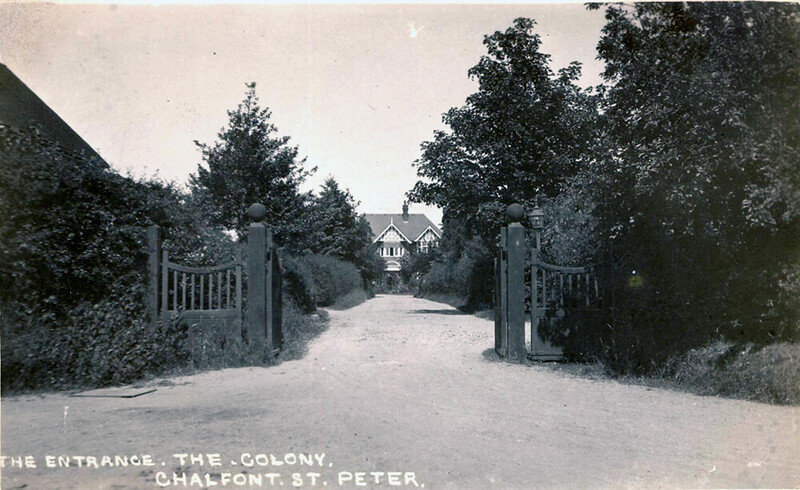 Chalfont Colony, now the NSE, post marked 1945. 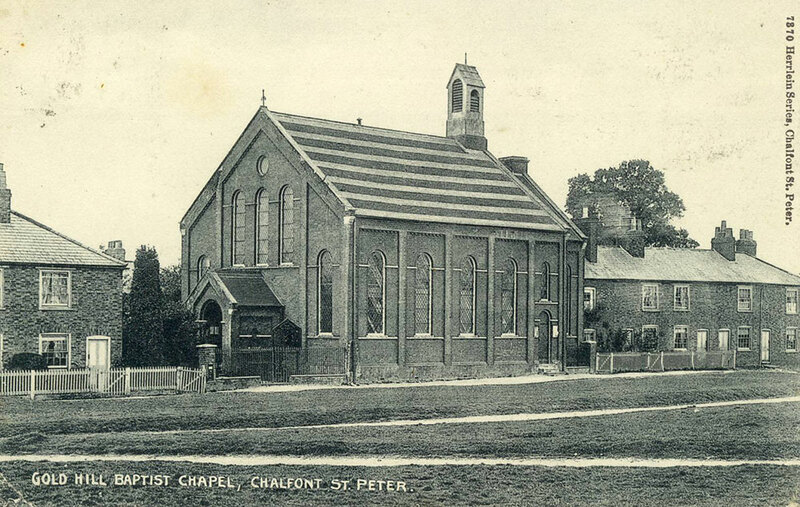 Chalfont St Peter Church, post marked 1916. 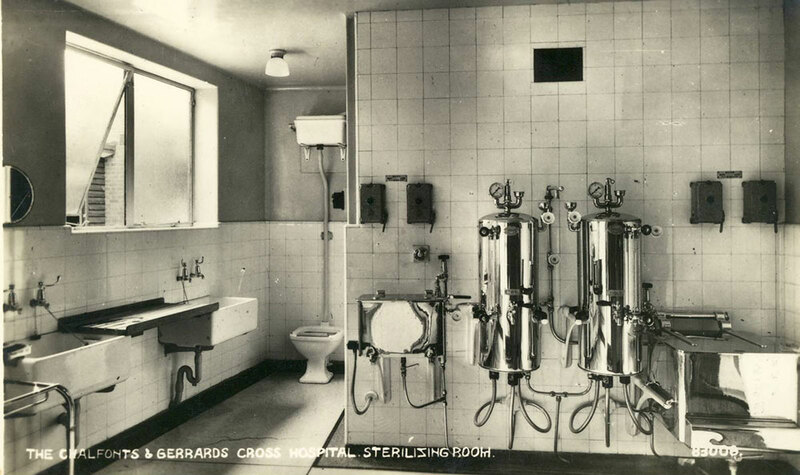 My only Chalfont Hospital card (others went for silly money) of the sterilising room - no postmarked date. From memory the hospital was donated / set up for the village by the Hibbert family. Makes me wonder what happens if they ever try and close / sell it if there are deed restrictions. The picture you've been waiting for... The brand new precinct celebrated in picture card format... quite a contrast from the earlier images of the high street... NSS brings back good memories from my childhood. Frost still there. 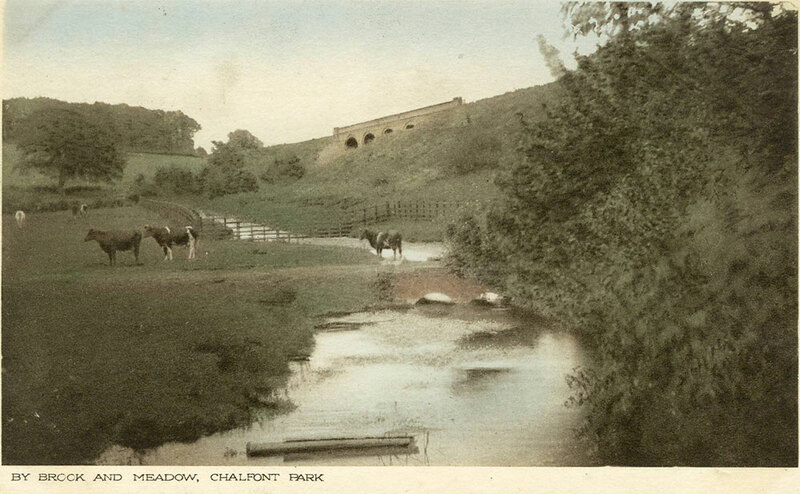 Chalfont Park bridge and meadow. No post mark date. Probably strictly speaking Gerrards Cross. I assume the bridge is for the railway. 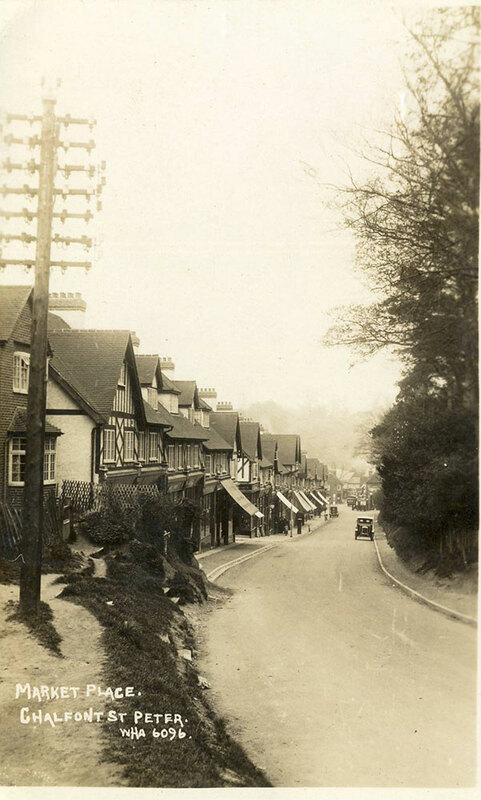 Looking down Gold Hill Common in Chalfont St Peter. 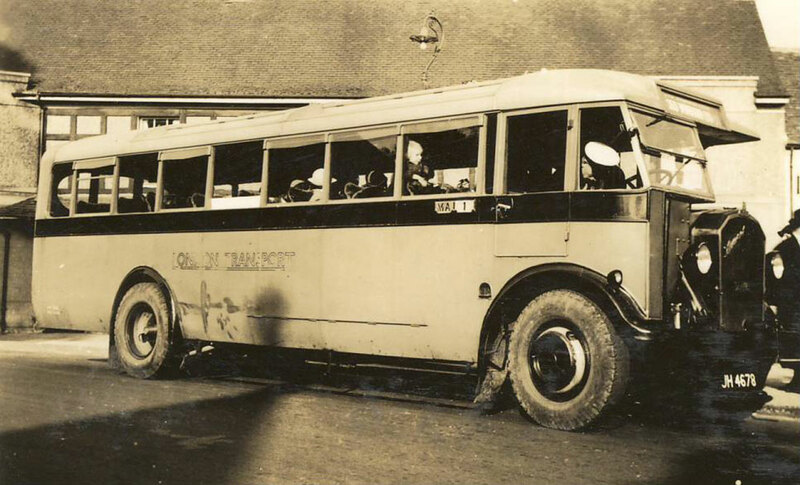 Post marked 1933. I wonder if they sledged down it when it snowed like today. 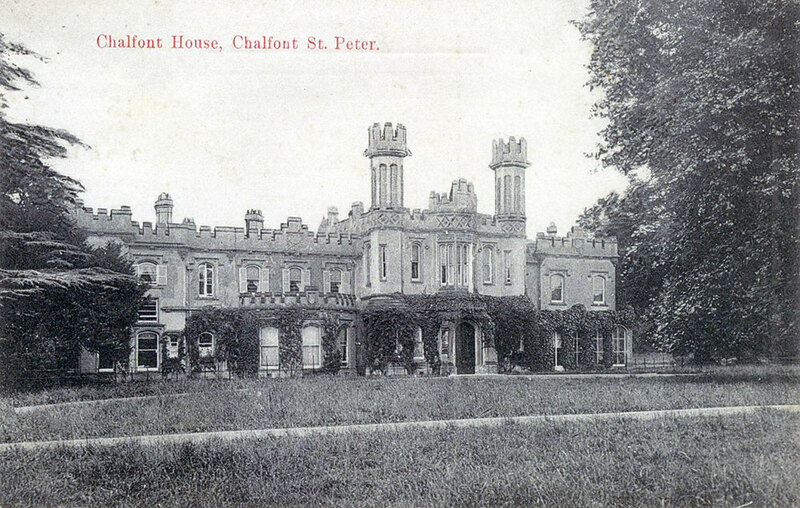 Chalfont House, post marked 1910. Gold Hill Baptist Church, post marked 1905. 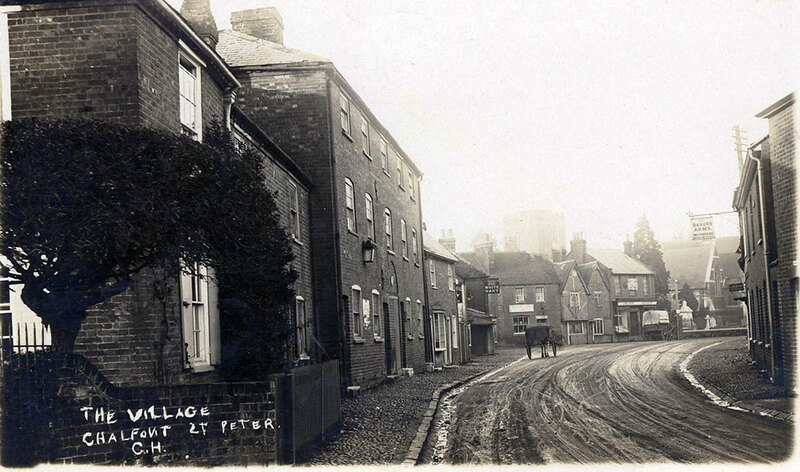 The High Street including the Bakers Arms. 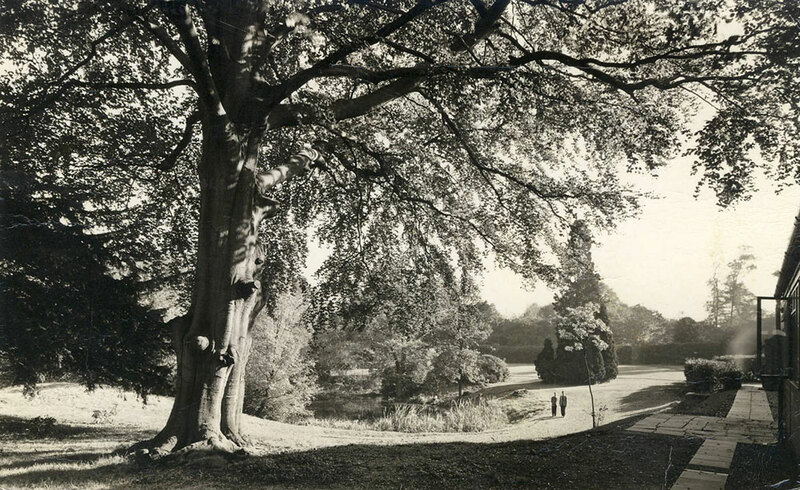 Black and white photo of the Chestnuts, Gold Hill. St Jospehs Catholic Church at the top of the village. Pre the new roof! No post mark date.